Where is the last Jedi? In service of Supreme Leader Snoke and the powerful First Order, Kylo Ren and a legion of stormtroopers invade Jakku in search of the star map that will lead them to the last Jedi in the galaxy, Luke Skywalker. 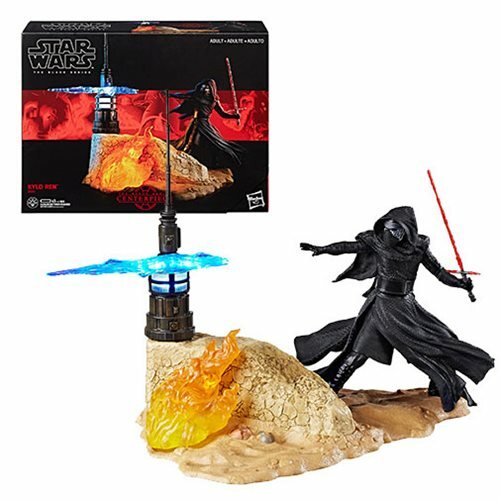 Imagine Kylo Ren landing on Jakku in search of the map that leads to Jedi master Luke Skywalker in Star Wars: The Force Awakens with this 6-inch scale Star Wars The Black Series Centerpiece Kylo Ren, featuring Kylo Ren wielding his iconic lightsaber and threatening all of those on Jakku who dare oppose him. With a premium base featuring lights that invite building out the iconic scene with more figures, vehicles, and accessories, Star Wars The Black Series Centerpiece Kylo Ren truly serves as the centerpiece of any fan’s treasured display. Includes: statue/base and instructions.